What’s Next in the Campaign Against Monsanto in Pima County? 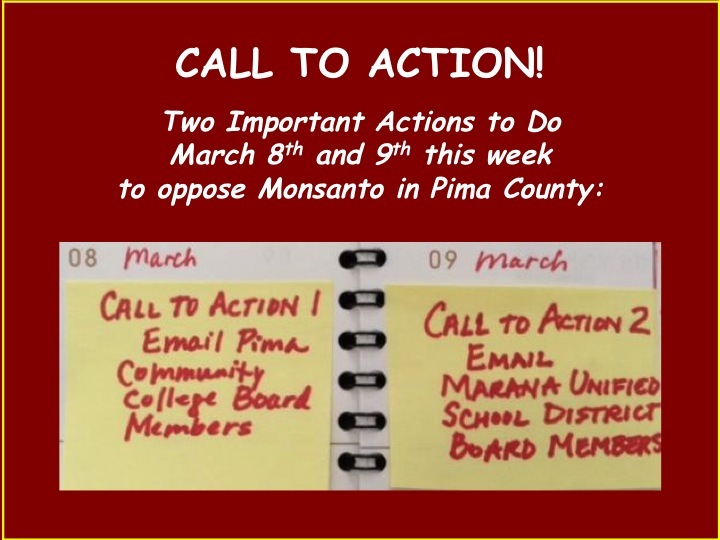 Call to Action This Week: Tell the Pima Community College Board Members and the Marana Unified School District Board Members to Say No to Monsanto! Although Monsanto dropped the payment in lieu of taxes (tax break) proposal, it is still expected to apply for a foreign trade zone status. Receiving foreign trade zone status would give Monsanto advantages we do not want it to have, so we need to generate massive public input against Monsanto’s application being approved. We will reveal more details about how to oppose as soon as Monsanto files its application. We have two big Calls to Action this week—not to the Board of Supervisors, but to governing boards of two educational institutions in Pima County. The Pima County supervisors’ involvement in Monsanto’s foreign trade zone application is off the table now, but both the Pima Community College Governing Board and the Marana Unified School District are still considering options having to do with Monsanto. That means we need to write these board members or speak to them in person at their board meetings this week.